One of the most noticeable home improvements that you can make is landscaping lighting installation. Whether you upgrade the front yard or enhance an outdoor living space in the backyard, it pays to work with a professional electrician in Newton. While some outdoor lighting can be installed by the homeowner, such as individual solar options, residential electrical services and wiring should be handled by a pro. A combination of lighting techniques is often the most effective for Newton outdoor lighting. The type of lighting that will work best in your situation will depend on how you use the space, the existing electrical options, and your home improvement budget. Outdoor lighting designers – yes, that’s actually a thing – often recommend that you use layers of light to create a variety of benefits. Path lighting, which can be placed along steps, stairs, and pathways, can be used to improve safety. Uplighting can be used to highlight special features, including water features, trees, and outdoor fireplaces. Downlighting can be used to enhance landscaping features, as well as to provide task lighting for outdoor cooking and dining. When you install Newton outdoor lighting in layers, it works to create interest and make the entire space safer for you and your guests. Outdoor patios and exterior decking are also great places for landscaping lighting installation. Deck posts are an excellent place for solar options, adding interest and safety. Under deck lighting can be used to eliminate dark spots to enhance security for after-dark entertaining. Deck and backyard steps and stairways should be well-lit to prevent trips and falls. Make sure to go over your ideas for lighting and the reasons behind them with a professional electrician in Newton. An experienced electrician will have ideas that you might not have considered that could make all the difference in your outdoor lighting experience. Another benefit to upgrading your Newton outdoor lighting is to increase efficiency. While your property may already be well-lit, it might be ready for an update. Improving your existing lighting to the new LED options helps to reduce energy consumption, lower utility bills, and is much more friendly to the environment. If you already have existing residential electrical services in the areas where you want to upgrade, you might not need to replace the fixtures or have new wiring added completely. Of course, this will depend on the state of the fixtures and their ability to work with the new LED lighting. Studies show that just by switching lights to a more high-efficiency option can save homeowners up to 80 percent in the cost to run their outdoor lighting. LED light bulbs do not need to be replaced as frequently as standard bulbs, reducing ongoing maintenance. In addition, more efficient lighting often provides better quality lighting for outdoor entertaining, cooking, and dining. When you hire a professional electrician in Newton to update your landscaping lighting installation, you also add value to your home. Many DIY projects will save you money initially, but for actual real estate value increases, it is always best to hire a reputable service provider. 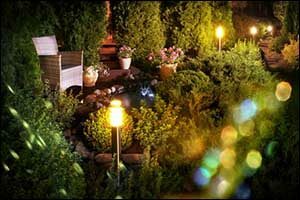 While there might still be snow on the ground and a chill in the air, the best time to start making plans for upgrading your outdoor living space and landscape lighting is right now. Begin by working with a local electrician to discuss your ideas for Newton outdoor lighting. Create a budget for all of your outdoor improvements and make sure to include residential electrical services. Whether you want to enhance a cooking and dining space or create an outdoor living room for relaxing and entertaining, landscaping lighting installation is an important part of it all. Our team of experienced electricians and technicians can help you make smart choices for your outdoor lighting upgrade. Give us a call at 1-857-829-0516 to start making plans. We can provide you with a free estimate for any work that you want to be completed. Not sure what your property needs in the way of outdoor lighting? Give us a call anyway. Our team can provide you with information on all of the options that are available in your area, based on your goals and budget. We have many years of experience working with both commercial and residential clients, providing top quality services as a professional electrician in Newton and the surrounding Greater Boston area.